Run the downloaded EXE file (pdftojpg.exe) to start installation, click on Next Step button 4 times to install PDF To JPG on you PC. 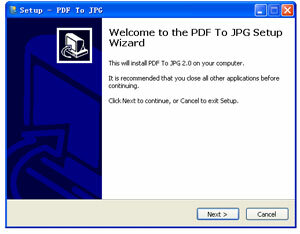 After installation, double click the PDF To JPG icon on your desktop. You will see a Window ask you to select a format to convert into. Click on your favorite output format then you will see the main window. Click the Add button to add a PDF file into the file list. At the right side of the main window you can see a form, which you can set the output image DPI and conversion page range. Below the form, there is a Browse Button. Click on Browse button to select a folder path, which will be the destination of converted image files. Click on Start Converting Now button to start the conversion task.